Designers are never free, they get to deliver tons of tasks in order to meet the desire end and all the deadlines. It is very hard to fulfill every bit because sometimes lethargy too occurs since a designer is also a human being first. You never know what amount of struggle he has to put into his work to create something superfluous. There may happen a shortage of ideas, there may occur some psychological lapses and there can be a lot of reasons on the work place to hinder the efficiency of a designer. If he shows grace under pressure surely he has potential to outdo himself. I have been designing templates to accommodate all the designers who are always in haste, who are trying their best to make everything probable on time. So here goes something fruitful. 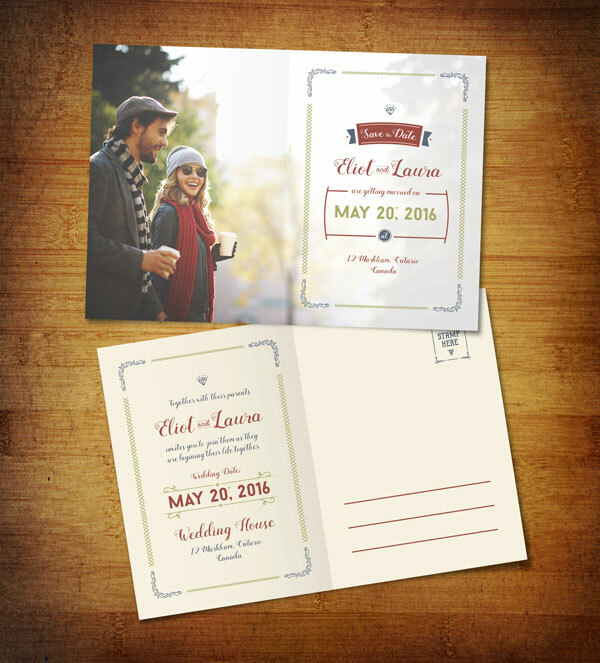 Today I designed free save the date pre-wedding post card design template which you can use easily. Just insert in the name of the couple, the venue and timings of the function to let the visitors and relatives know when and where the wedding bells are going to ring. However you can always hand this over by yourself if you want to, because sometimes it so happens that due to scarcity of time you really get to post the invitation cards so this post card is the best option to go about, it is ready made apart from the due additions and changes later on as required. I hope it helps you out and also give you ideas that how you can build an invitation post card of wedding on your own. Do let us know what you think about this, the design is kept simpler and beautiful, with subtle colors and a stunning feel. The font is apt and the post card is appearing quite retro and magical. Subscribe us for more and we will keep entertaining you with more free stuff in future as well. Your feedback is encouraged and responded in the same way as a positive gesture from us to you. Thanks in advance for all the appreciation we foresee from you.